The ATI 'Coral Plus' T5 tube combines the properties of a Blue Plus (50%), Aquablue Special (40%) and Purple Plus (10%) producing a tube with a cool, crisp white colour with hints of red and blue. 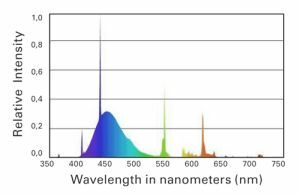 The higher blue component compared to an Aquablue Special produces better fluorescence in corals and the red component is excellent for colour rendition. Recommended Use: As a stand-alone tube or in combination with Blue Plus, Purple Plus, True Actinic or other supplemental T5 tubes.